Microsoft introduced new features to its Bing search engine Thursday including Quick Tabs, an Answer box, and new mapping tools powered by Foursquare to deliver real-time data embedded in maps. Bing says the move represents a further departure from Google-style listing of search results and one toward what it calls a "decision engine" where Bing can intuitively deliver exactly the price, link, score, or weather forecast you are looking for. The most striking changes to the Bing search results page is the removal of the Explorer navigation pane on the left-hand side of the Bing search results - replaced by the introduction of Quick Tabs (which are related to search queries). Another big change is the delivery of an Answer box that include a combination of reference data, most popular results, and real-time information culled from pricing engines, weather sites, and news sources. The changes do not represent the introduction of new under-the-hood search technology. 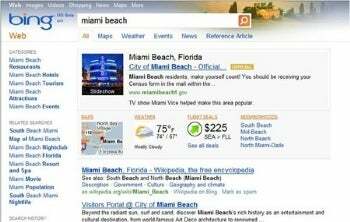 Rather, Bing representatives say, it is re-jiggering the way search results are delivered - hopefully in a more intuitive way. Bing says it will roll out all the new features in the coming month with only a small percentage of users seeing updates this week. Microsoft wants to play around with the location of Quick Tabs, which provide fast access to subcategories of search such as news, events and weather. In its current state, Bing puts these categories in a sidebar to the left, but screenshots of the new format show the tabs on top of your basic search results. I think the success of this feature will depend on how quickly the user can toggle between tabs, and whether the search page they're on in one tab is preserved if they temporary move to another. Bing inked some major deals with Facebook and Twitter in October, and now we'll start seeing some new features with real-time search results. 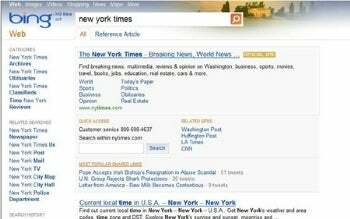 One of the things Bing will do is show the most popular shared links from news Web sites, such as the New York Times, but Microsoft provides no other examples. Hopefully, there are more. 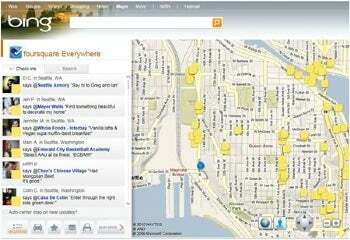 We got acquainted with Bing Map Apps in December, when Microsoft introduced a bunch of new mapping features in beta. Now, Bing's jumping into the location-based craze with an app for Foursquare, a social game based on visiting real-world places. Turning on the Foursquare Map App shows you who has unlocked specific badgets, and where people have become "mayor" of certain locations. Even if you don't play Foursquare, Microsoft says the app can be used like an "interactive day planner" that tells you what's popular in an unfamiliar city.